Our 16 year old son Eric has spastic quadriplegic cerebral palsy. We are a very active family and Eric has always enjoyed being part of our outdoor activities. As he has gotten older and has grown in size it has been more difficult to find a jogger that is built strong enough to handle his weight and also is tough enough to handle less than optimal terrain. After much research and talking to many people we purchased the Axiom jogger. We are very happy with it. From the first moment he was in it we could tell that Eric loved it. The Axiom is well built and very comfortable. We have taken it with us on numerous walks and for light jogs. It is stable and easy to maneuver, even going over hills and off road through rocky terrain. We have also used it on the rough cobblestones of Boston and over the many curbs in New York City. It has performed optimally through each and every adventure. 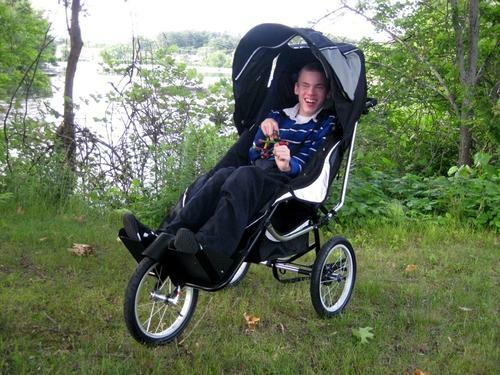 We do not hesitate to recommend the Axiom jogger and can truthfully say that it has added a lot of fun to Eric’s life.